We're happy to see so many great submissions to the video competition. You can now view all the qualifying videos and vote for your favorite. The goal of the competition is to raise awareness of Open Educational Resources (OER) and solicit short, creative videos that help explain what Open Educational Resources are and how they can be beneficial for teachers, students, and schools everywhere around the world. The competition closed on June 5. Public Choice Award voting will end July 11, 2012. We hope to announce all the winners on July 18, 2012. Good luck! We wanted to launch the voting for the Public Choice Award today, but we'll need a few more days to get it up and running. We apologize for the delay, and we'll announce here when we're ready to begin. Thanks again everyone for submitting your great videos, and for your patience with this process. Congratulations on getting in your submission to the Why Open Education Matters video competition. It looks like there's a bunch of great videos and we can't wait to take a look at them all. We'll have more information soon on next steps, particularly the public choice voting where you'll be able to vote for your favorite video explaining OER. Thanks again everyone. If you have any questions or had a problem submitting your video, please send us a note at tvol [at] creativecommons [dot] org. One week left to submit your videos! 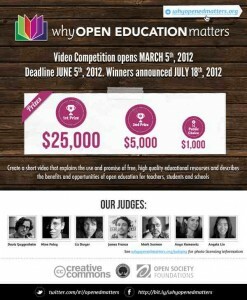 There's one week left to submit your videos to the Why Open Education Matters competition. We're super excited to see all the creative videos you've created. Just as a reminder, be sure that you've read and understand the Official Rules. * Non-U.S. citizens may enter the competition. * You have to be 13 years to enter. * Your video should be no more than 3 minutes long. * Videos are due by midnight on June 5, 2012. * You can work in teams. * Your video has to be licensed under CC BY. Open licenses are a central component to Open Educational Resources. Creative Commons licenses are the global standard for open content licenses. CC provides the legal framework for OER. With CC licenses, learners can find and incorporate free materials for reports and presentations; educators can customize textbooks and lesson plans; universities can distribute video lectures to a global audience; and publishers can adapt materials and develop services for an enhanced learning experience. Here's a nice video done by the Creative Commons team in New Zealand that explains the licenses. There have been some questions about whether persons who are not U.S. citizens can enter the video competition. The answer is YES! Of course, it's great that the U.S. Department of Education is helping host the video competition, and that Secretary Duncan has voiced his support for Why Open Education Matters. What themes should my video contain? There's a lot of different ways that you can approach the charge of "Create a short video that explains the benefits and promise of Open Educational Resources for teachers, students and schools everywhere." We want you to be as creative as you can in writing, recording, and editing your video submissions. Your video should be sure to communicate to a wide audience a clear, concise, and exciting vision for open education. Keep it simple, but think big.